shine brite zamorano: shaping up with p-nut. 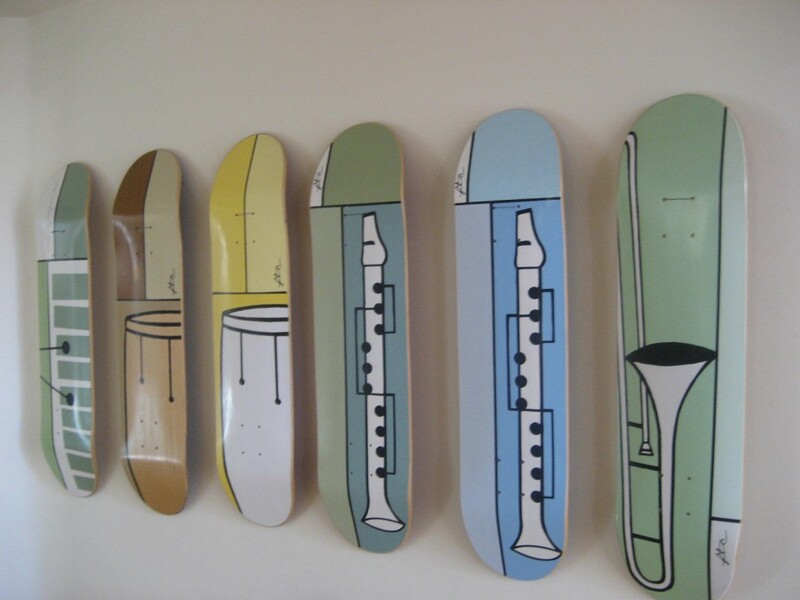 In particular, we have been looking at a series of skateboard decks he did a few years ago. The 4th graders are all involved in band and orchestra this year, so I thought this would be a great connection to tap into. I introduce the concepts of positive and negative to the kids. We also discuss the importance of balance between the positive and negative in terms of filling the page and making an interesting composition. We look at the work they already made for their line study and identify them in those. I then share Greg's skate decks and students can identify the contrast between the subject and background pretty quickly due to his contrast in white and color. 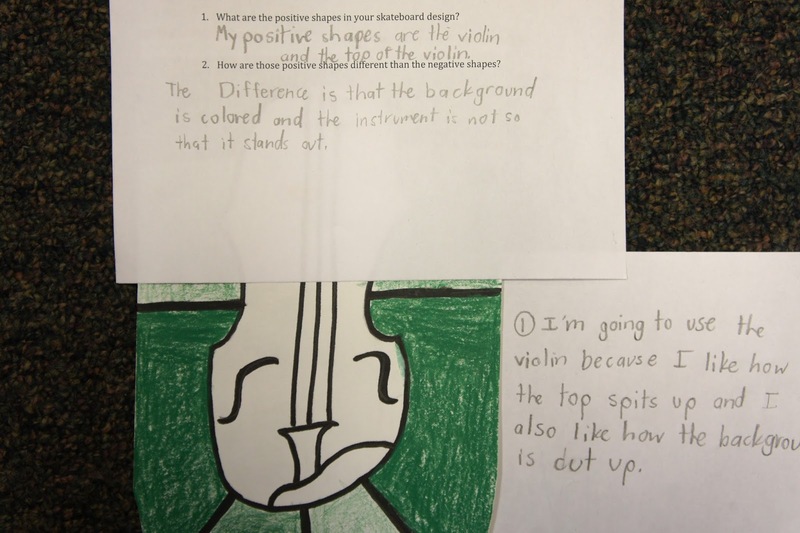 For this project, I provide the students handouts of the instruments that they are playing this year. I model sketching 3 different designs that have at least parts of 2 instruments in them. Students do their thing in sketch form and when they are done I ask them to break up the negative shape with at least 3 lines. Once they complete their sketches, they think about which one they want to do as their final and write down their reasoning in the form of a "because" statement. Students then share their reasoning with a neighbor. With this step I also model being an active listener- the listener should then replay in support of the designer's choise or offer reasoning of their own why another design might be more interesting. Students shape their paper decks by cutting curves at the ends of a long sheet and draw their chosen image softly out on the larger paper. They trace their contour lines with black markers, and like their line lesson, make some lines thin and others thick for added variety and contrast. When it comes to coloring their decks, they must only use one color. They can alter it's value by pressing soft, medium, or hard. They may also add black to the color. 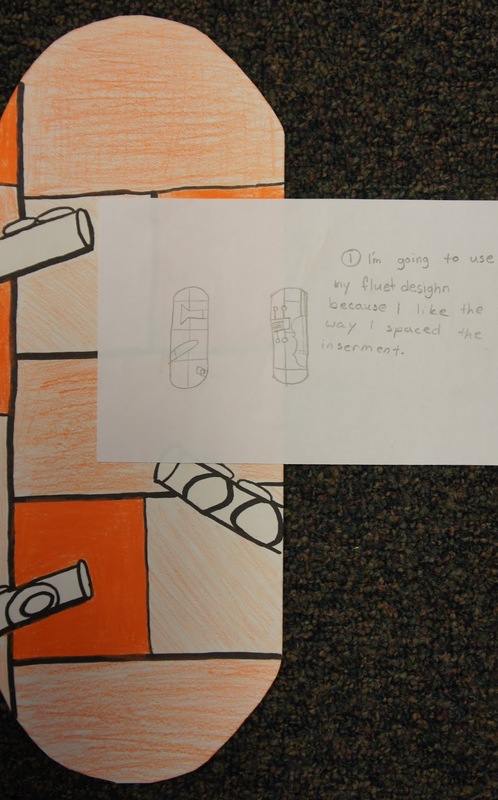 Once they are done, they complete an exit slip reinforcing their understanding of positive and negative shapes. Boom. Pretty engaging for the kids. Greg's style is totally approachable and workable for the kids, and anytime they get to design something pop culture related, the kids more readily get into it. Dynamic artwork by students and a well crafted lesson by the teacher. Five stars for everyone.